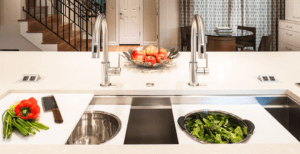 Among the many tasks that will take place during the construction and planning of your new kitchen, there will be aspects you did not take into consideration. Most people think about the bigger questions like, paint grade or natural wood cabinets? But there are so many other other not so desirable to think about questions that you should be asking before rushing into demo. I don’t mean color rules or what’s currently in style rules, I mean real life “can I actually do this?” kind of rules. Check with what your building codes are for your area and make sure you are working with a licensed contractor that will make sure the whole project is up to code the entire time. How should my cabinet drawers/doors open? This comes to be quite the oversight until you realize you can’t open a door because it runs into the drawer. To avoid this problem, it is best to work with an experienced kitchen designer to ensure this problem does not arise after holes are drilled into the doors. What profile should be countertops have? Again, this decision seems to be overlooked until the last possible second. 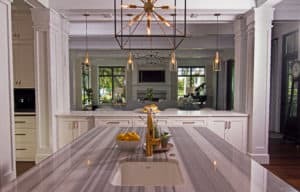 The edge of your countertops may seem like it would be a quick and easy decision, but there are so many profiles to choose from and picking the wrong one would impact the look and feel of your kitchen. What finishes for the fixtures? Very important question to ask because again, selecting the wrong finish or two different ones. Finishes are also a very functional aspect, for example, brushed finishes hide finger prints and other blemishes, while silver are great blenders into any color palette. How to mount the silk? What finish of the stone? Your countertops is not the only stone in your kitchen. When deciding on the finish of stone, it is likely that you may also have to think about the flooring and the backsplash. What material should my toe kick be? The typical answer to this question year ago was the same material as your cabinets, bit now toe kick can be metal or if you have white cabinets, you can opted for another color of toe kick to decrease the look of scratches and scoffs. 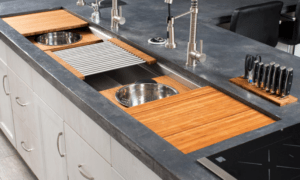 Many new innovations present themselves to the kitchen and bath industry every year, but not many are as captivating as The Galley sink. The Galley sink is the first of its kind combining a sink with the functionality of a well thought out work space. 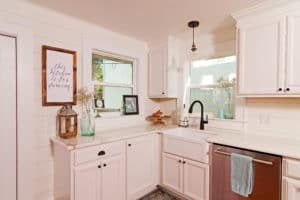 The idea for the sink was conceived by an award-winning kitchen and bath designer who wanted a centralized work space where all tasks could be completed. The simple idea has now grown into a business that crafts its genius in the United States. The sink comes in several different sizes to make cooking and cleaning convenient for your sized kitchen. The sizes range from 2 feet which is about the same size as your typical farm sink, all the way to a whopping 7 feet! The bigger the sink the more inserts you’ll have room for! For example, the 2-foot workspace comes with a 5-piece culinary kit while the 7 foot sink comes with an eleven piece culinary kit. Culinary kits include accessories like, drying racks, cutting boards, and colanders and much more with the larger sinks. Culinary kits come in a variety of different colors and materials such as bamboo, graphite, high intensity white or grey resin. And lastly, the coolest accessory, a built in Knife Block! The Galley sink is certainly a lifestyle and much more than your typical sink. It is great for entertaining and will be the show stopper at every party. One of the better aspects of living in Florida is our winters tend to be short lived and in no time we are back in the pool and having barbecues. 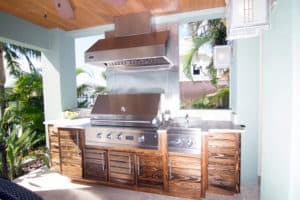 Well, the sun is not the only thing heating up lately, many homeowners are heating up summer with new high tech grills and outdoor spaces worthy of taking the heat for. Just in time for summer, McCabinet has introduced two new grills that will make any gathering mouth watering. First of the new grill lines come from Blaze Grills. Blaze offers an array of products from the best gas grills on the market and charcoal grills, gas griddles and other grilling essentials. Their gas grills come in different models and size such as, a traditional series, LTE series and a professionals series. With the traditional series, the 32 inch, 4 burner grill features 66,000 total BTUs, fast start time, and flame stabilizing grids to minimize flare ups. Next the LTE 32/4 series has many of the same features of the traditional, but does offer illuminated control knobs for night time grilling and it just looks cool. The professionals series has a lot of the same features but has much more space for grilling, 18,000 BTUs per burner, and features a rotisserie kit that includes a waterproof motor. Next up are the TEC Infrared Grills, Tech offer many different accessories, but their grill line up is even more spectacular! What makes these grills special is the infrared technology with the incredible temperature range of a low 200 degrees Fahrenheit for smoking and 900 degree Fahrenheit for the perfect sizzle on hamburgers in 8-10 minutes. Starting with their portable grill, the G Sport is the most versatile grill because, well, it’s portable. There is so much about the G Sport that makes it an amazing grill, such as, it’s certified to be used on any surface, even wood, no cold or hot spots, self-cleaning cooking surface and a stainless burner that can reach as high as 1400 degrees. Other grills offered are their free standing and built in grills, they offer the same features as the G Sport, but varies in grilling space and whether it is freestanding or built in to your outdoor kitchen. Either way, you’re getting an amazing grill. Whichever grill you choose to be the centerpiece of your summer barbecue, there is no going wrong with either a Blaze or a TEC Infrared. Both brands are great investments in high quality grilling and many years to come of great food and summer memories. Starting off the year with something functional to add to the kitchen, a separate baking station! By adding this feature, using a rolling pin and other baking essentials is easier due to the height of the counter. This is a trend we are glad to see! The white kitchen will always remain a classic favorite and will never go out of style, but in 2018, expect to see more cool neutrals such as blues and grays mixed in with white to use as a contrast or as all the cabinetry. A new aspect to kitchens that is new in 2018 is installing surfaces that are antibacterial. There are counter top surfaces that can help purify the air while eliminating chemicals in comes into contact with. Going back in time a bit, this trend seems like something out of the 1950’s. Having the dining table in the kitchen is something homeowners are gearing towards instead of an island. 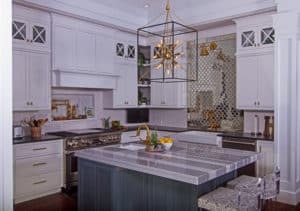 Not everyone wants a large island to eat at with family or have the room for an island, so having a table in the kitchen instead is a great alternative. As much as a very open floor plan is better than an completely closed off one, many homeowners are tired of all the openness and want a defined space. By building a half wall with pillars and a countertop, it will separate the room and add more counter space! Another interesting trend of 2018 is adding new additions to your countertops such as grooves to aid in drainage of wet plates to travel straight into the sink. White and stainless steel sinks have had their days, or rather years! This year, expect to see concrete sinks and copper sinks in darker colors. A white kitchen is a staple trend that will stand the test of time. It is classic, beautiful and can still embody it’s own unique qualities. A white kitchen can take on many different styles from modern to traditional and everything in between. But just as a slimming little white dress may not look as slimming, a white kitchen may not be as statement making when everything is white. When a kitchen has too many white elements it will begin to feel sterile. 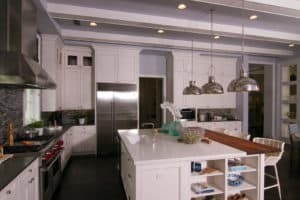 To avoid a hospital like look, here are the best places to use white in a kitchen. Lets talk about the cabinets, they essentially make a kitchen a kitchen. One of the most popular cabinet style for white is shaker. This style of cabinet has clean lines and can adapt to different styles of hardware. White kitchen cabinets stand the evolution of design styles as there are so many different styles that can be achieved with white cabinetry. A beautiful accent to white cabinets is a rich wood tone island with tones of grey. Adding the wood tones will warm up an otherwise cold kitchen. One of the best places to incorporate white is in the backsplash. A natural stone with a white or creamy hue paired with the white cabinets is a great choice for a timeless look. A white tile with some shape to it will cater to a trendy vibe while maintaining the integrity of a white kitchen. As for flooring, the best flooring to use to compliment a white kitchen is beautiful hardwood floors that will both ground the space and warm it up to contrast to the white cabinetry and backsplash. Since a white kitchen is the main goal, the walls should be painted a white, cream or ivory. There are endless options for white wall colors. But beware, do not make the wall color the same color of the white cabinetry, the cabinets will become lost and blend into the walls. 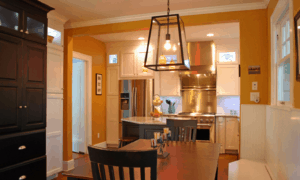 Select a color that will compliment the white cabinetry and not compete with it. Above all, the most important elements of a kitchen are the countertops, it’s where the prepping happens. There are so many options with materiel and colors. To keep with the feeling of a white kitchen, marble or quartz is always a great option. Or for some warmth and dimension, a dark stone or wood block top would work beautifully. With accessories, the white vs pop of color debate is up to personal preference. With so much white and neutral tones, a pop of color would bring dimension to the kitchen.